Major General Maurizio Boni was born in 1960 and graduated from the Military Academy in 1981. 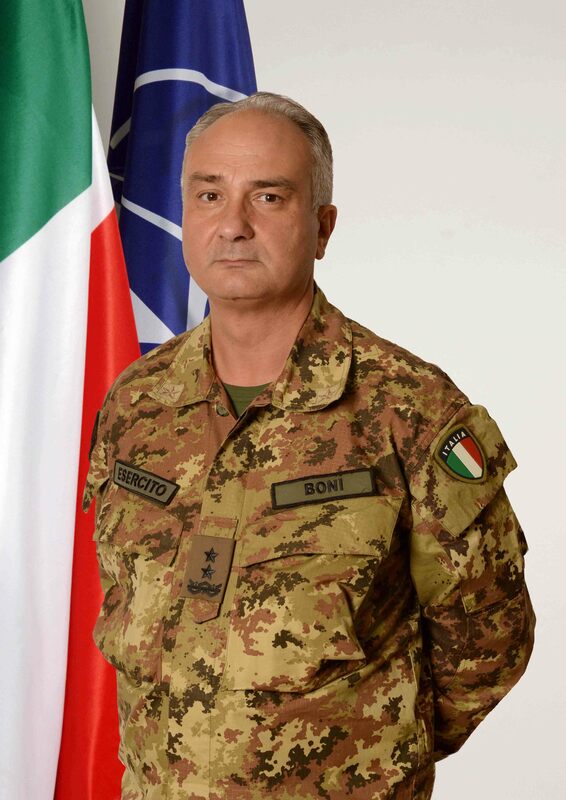 Prior to taking up his current position as the Chief of Staff at the NATO Rapid Deployable Corps (Italy) in November 2014, he has been from June 2012 to October 2014 the Commander of the Italian Joint Force Headquarters (ITA-JFHQ), and Vice Deputy Chief of Staff for Joint Operations at Italian Joint Operations Headquarters (ITA JOHQ) in Rome. During General Boni’s tour of duty, the Italian Joint Force Headquarters has been employed in the Philippines, Libya, Central Africa and Middle East. In this context, General Boni led the Joint Evacuation Task Force operating in Sud Sudan, to evacuate Italian as well as European citizens in danger in that Country. From 2011 to 2012, he has been the 76th Commander of the Cavalry Brigade “Pozzuolo del Friuli”, and from 2007 to 2010 he has been the Head of the Plans and Policy Division at the Allied Joint Force Command Lisbon. In this position he led the planning team for Operation “OCEAN SHIELD”, the current NATO Counter Piracy Operation off the Horn of Africa. From 2004 to 2007 he was the Chief of the Education and Training Department of the Italian Army General Staff in Rome and Chairman of the Training and Preparation of Forces FINABEL International Working Group. As early as a Lieutenant and later as Colonel, he commanded several army units from platoon, company, battalion and regiment levels serving also as Platoon Leader in the Military Academy, in Modena. As Major and then as Lieutenant Colonel he was twice assigned to the Army General Staff, first as Section Chief, then as Deputy Chief of Staff for Arms Control and later as a faculty Member and Syndicate Chairman at the Center for Higher Defence Studies, at the Joint Services Senior Staff College in Rome. In 2003, within NATO’s Operation “Joint Guardian”, he deployed to Kosovo as Senior Military Assistant to the KFOR Commander, and Staff Coordinator at the KFOR Headquarters, in Pristina. Over the years he completed a number of courses, including the Army War College and the Joint Services Senior Staff College in Rome, the international Training Course in Security Policy at the Graduate Institute of International Studies in Geneva, the Training Course in International Affairs for Public Officials, under the auspices of the Italian Society for International Organizations in Rome, the European Security and Defense Policy High level Course, at the ESDP College in Brussels as well as the 62nd Session of the Institute for Higher Defense Studies in Rome. Major General Boni holds a Master’s Degree in Strategic Sciences, a Master’s Degree in International and Diplomatic Relations and a Master of Arts in Global Strategy and Security. He has published several articles in the Military Review focused on security policy, he is the author of two books, namely “Arms Control and International Security (2003) and “The Political-Military Dimension of the OSCE” (2009), and is co-author of the book “Anthropology and Security Studies” (2013). He was lecturer at the Post Graduate Institute of European Studies “Alcide De Gasperi” in Rome, where he supervised the Course on “European Security and Defense Policy” during two consecutive academic years (2005-2006 and 2006-2007). He is journalist, and Senior Fellow at New Westminster College, Vancouver-Canada. His decorations include the Army Bronze Cross Medal of Merit, the Knight of the Order Medal of merit awarded by the Republic of Italy and the NATO Meritorious Service Medal. Major General Boni is married with Laura, and is father of Filippo and Alessandra.